I get lots of pushback when I post an article panning exchange-traded funds. ETF fanboys (and girls) base their love on two things: ETFs’ cheap management fees and convenience, because they let you jump into an entire sector in one click. My response? Handle these so-called “set it and forget it” plays with a lot of caution—or risk a big dent in your savings. Far too many ETFs (like the four I’ll reveal below) are cheap for a reason: lousy returns! Worse, some aren’t even cheap—like my “second-worst” pick below, which charges an outrageous 2.1% fee and has no one at the helm at all. Let’s unmask these four laggards now, which I’ve ranked from “worst” to just “poor.” Along the way, we’ll uncover five much better choices throwing off 6%+ dividend yields and/or double-digit payout growth. I can think of only two “good” things about SEA: its 5.6% dividend and its “reasonable” 0.66% management fee. But I say both with my tongue planted firmly in my cheek, because SEA’s dividend has collapsed a whopping 79% since inception—and its share price went down with the ship! Bargain hunters beware: with the global economy slowing and trade tensions bubbling over, SEA’s misery will only continue. Worse, many of the stocks it holds, like South Korea’s Hyundai Merchant Marine, are based overseas, adding currency risk to the mass of storms raging over this fund. My advice? Give this one—and the foundering shipping business—a pass. 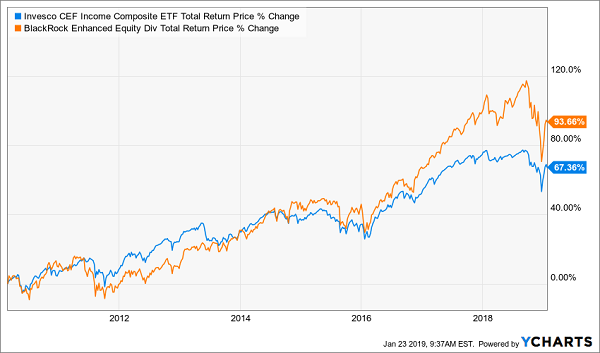 Closed-end funds (CEFs), distant cousins of ETFs, routinely throw off dividends of 7% and up—and the best CEF buys trade at outrageous discounts to net asset value (NAV, another way of saying the value of their portfolios). Jumping in when these discounts are at their widest sets you up for “snap back” gains as they swing back to normal. Some folks try to take a shortcut by purchasing a bunch of CEFs at once through an ETF like PCEF. And the truth is, there are many reasons why you’d be tempted to jump at PCEF. 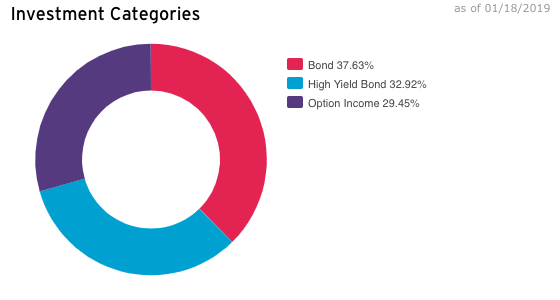 For one, it evenly splits its portfolio among corporate- and high-yield-bond CEFs, as well as covered-call funds, which trade options on their portfolios for income. That’s gotta be safe, right? Throw in PCEF’s outsized 7.6% dividend and cheap 0.5% management fee and your finger may already be hovering over the “buy” button! Well, not so fast—because as a “fund of funds” PCEF is also stuck paying fees on funds it owns. Add those in and its total expenses surge to 2.1%. And remember, this is for a fund that blindly invests in an index! It’s the worst of both worlds: high fees and no seasoned CEF expert working for you. 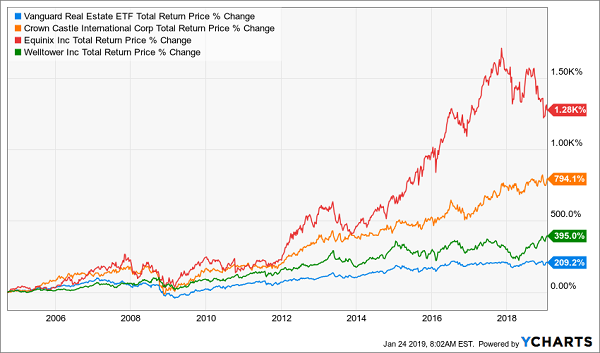 PCEF’s performance tells the tale: if you’d simply bought its current top-five holdings at the fund’s inception in early 2010 you’d have clobbered PCEF, with a 93% average total return, compared to 71%. But that doesn’t mean poor old PCEF is useless to us, because we can cherry-pick its strongest funds for cheap, high dividends. 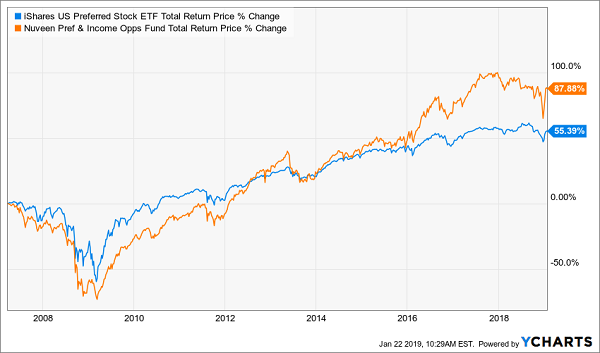 The BlackRock Enhanced Equity Dividend Fund (BDJ), for example, throws off a 6.6% payout—paid monthly—and trades at a ridiculous 15% discount to NAV. As you can see, BDJ has crushed PCEF—and it’s done so on less than half the management fee: just 1.1%. It’s a far better pick for income and price upside. Preferred stocks are retirement gold, thanks to their huge payouts: PFF, the benchmark for preferreds, yields 6.1%, and that’s small fry when you fish in this pond, as I’ll show you shortly. If you’re unfamiliar with preferreds, they can trade on exchanges, like regular stocks, but do so around a par value and dole out a set regular payment, like a bond. There is one other thing you should know: you need a lot of time and research to buy preferreds on your own. This in itself is something of a trap, because it might tempt you to buy through the passive PFF instead. Even more enticing: PFF’s “cheap” 0.46% expense ratio. Don’t take the bait, because as I just mentioned, when it comes to this obscure corner of the market, we need an experienced pro at the helm to delve into preferreds for us (and to be held accountable for the fund’s performance). That’s why you’re far better off with the Nuveen Preferred & Income Opportunities Fund (JPC). 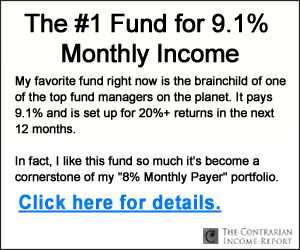 It’s a CEF that’s crushed PFF and pays a much bigger dividend (8.1%, or a full 33% more). Too bad first-level investors snub JPC due to its high fees, at 2.6% of assets. But keep in mind that the chart above—and every chart I show you—is net of fees. I don’t know about you, but I’m happy to pay $2,140 more in fees every year on $100K if management can drop me an extra $32,490 after their take! By now, you probably think I’m a CEF fanboy. No way! With real estate investment trusts (REITs), your best bet is to buy these high yielders individually. That’s the only way we can ensure we dodge troubled sectors like retail REITs, whose tenants continue to get whacked by online shops, and zero in on those riding booming megatrends (like healthcare and cell tower REITs). Enter VNQ, payer of a 4.5% dividend. This “dumb” ETF devotes a full 14.6% of its portfolio to retail REITs, its second-biggest sector! That’s because VNQ has no one at the wheel. It’s set up to blindly track an index, which is why you pay next to nothing (0.12%) in management fees. So just as we did with our CEF “fund of funds,” we’re going to “front run” VNQ by cherry-picking three of its top holdings. And we’ll pay zero management fees for these three picks! So let’s go with cell-tower operator Crown Castle International (CCI), data-center owner Equinix (EQIX)—both of which I tipped as top buys for fast payout (and share price) growth on January 8—and healthcare REIT Welltower (WELL). Top Holdings Clobber the ETF Again! That’s true. Apart from Welltower, which pays 4.7% today, the payouts on Crown Castle, at 4.1%, and Equinix, at 2.5%, are well short of the 4.5% VNQ pays. But don’t forget dividend growth: in just under five years, CCI has boosted its payout 221%, so you’d already be yielding a nice 6.0% on a buy made then. 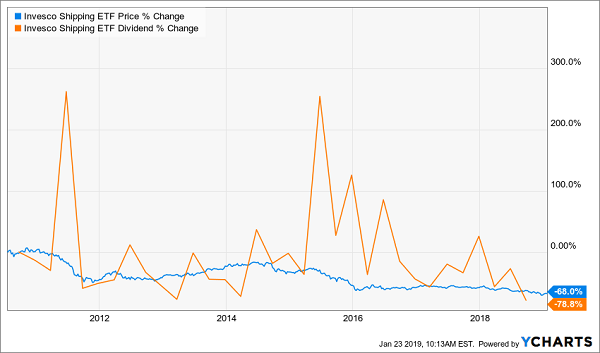 Its payout is up 35% in just under four years (not including a big special dividend in October 2015), so the yield on your original buy would have already topped 4%—in spitting distance of VNQ. Throw in Equinix’s mammoth 58% price gain in that time and the last argument for going with VNQ melts away. What if I told you that I could give you instant access to 20 of the highest—and safest—dividends on the market today? Right now, this massive 20-stock package throws off an average payout of 7.6%. And that’s just the average! Four of these cash machines pay over 9% … and one even delivers a monstrous 12.4% cash payout. The best part? Nine of these 20 send out cash dividends every single month. That helps steady your income stream and, of course, matches up perfectly with your monthly bills. These 20 are the current buys in the portfolio of my members-only Contrarian Income Report service. And I want to GIVE you access to this entire portfolio—including these nine cash-rich monthly payers—right now. 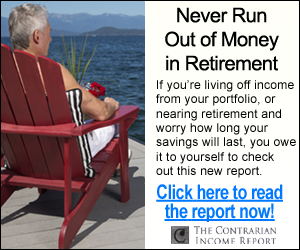 I can’t wait to share all my research on these rock-solid monthly paying retirement plays with you. Click here and I’ll reveal all 20 of the 7.6%+ payers in my portfolio, my 3 very best monthly payers to buy now.